Obama now has allies in Congress for his new climate change push, who will also turn to the public for help. President Obama’s new push on climate change will be an “aggressive campaign built around the use of his executive powers to sidestep congressional opposition,” which makes some sense: Republicans in the House of Representatives are so stridently against taking action on global warming they even killed an amendment in 2011 that simply stated humans are driving climate change. “Every day we wait, every time we allow an opportunity to reduce our carbon pollution pass us by, it becomes less likely that we will be able to prevent the worst impacts of climate change,” Waxman said at an event in the Capitol this morning. The immediate goal is to push the administration forward on key initiatives under its control—the task force’s first action was to send Obama a letter asking him to use his State of the Union address to clearly outline a comprehensive climate change plan, including laying out specific steps federal agencies will take, accelerating federal investments in clean energy and developing a strategy for protecting vulnerable areas of the country from the worst effects of climate change. Waxman thinks he has a willing partner in the White House. He noted that, on inauguration day, he spoke with Obama at the traditional luncheon and thanked him for mentioning climate change. Obama responded, according to Waxman, that “I didn’t just mention it. I emphasized it, I talked about it,” and then said it was time to go beyond talk. While focusing for now on the administrative route, the task force is not ruling out pushing for big legislation, either. 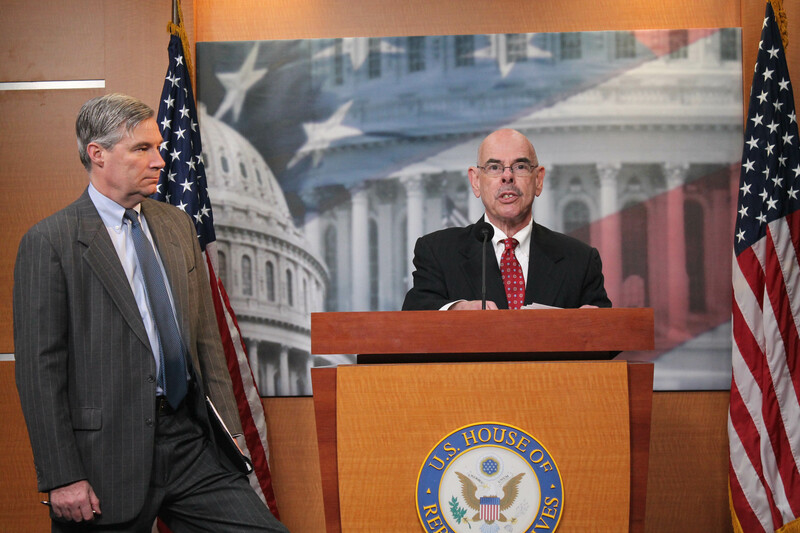 Waxman—the co-author of the cap-and-trade plan that many people forget actually passed the House in 2009—noted in the press conference he’s now focused on the prospect of a carbon tax. “I personally believe that if we try to put a price on carbon, we can help solve the seemingly intractable problem of global warming and at the same time help solve the seemingly intractable problem of the budget deficit,” he said. Waxman acknowledged the immediate prospects of legislation are dim, but said he hoped that aggressive executive action by Obama might bring Republicans to the table in Congress to pass legislation they can affect instead. A third, and crucial, element to the task force will be mobilizing the public to take action. Senator Whitehouse—who spoke passionately about the changes to the ocean already being measured in Rhode Island—emphasized that this outreach is badly needed. “We know that meaningful carbon legislation won’t pass in this Congress under the present status quo—of a Congress surrounded and barricaded by special interests, by polluters, by phony organizations set up by polluters to look like legitimate scientific organizations,” Whitehouse said.